Tyrone McCullagh [7(4)-0] made his first appearance on a big arena card at the weekend, although it was not the fight that he first hoped. 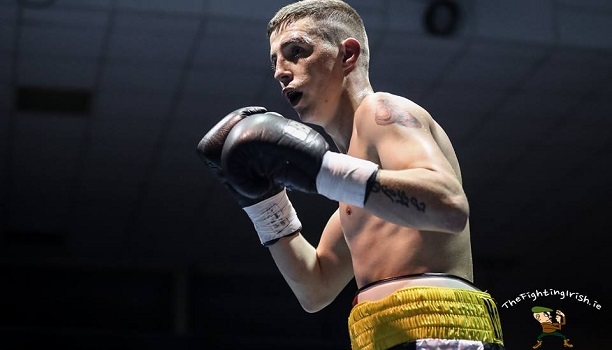 McCullagh opened the Belfast Boy show at the SSE Odyssey Arena but, while this was an experience in itself, he had hoped to have faced another Irish boxer in a more high-profile bout. ‘White Chocolate’ had agreed to face Dubliner Carl McDonald [2(0)-0] on the bill, however family reasons saw the Jobstown boxer withdraw. In his place stood Nicaraguan journeyman Jose Aguilar, whom McCullagh scored a shut-out points win against over four rounds. With the win in the bag, the Ulsterman wants to continue moving up through the ranks and a bout with McDonald still appeals. There’s nothing personal between the pair, indeed McCullagh does not even know the Tallaght man. Instead he views it a fight which makes perfect sense for both.